Computers in the classroom include any digital technology used to enhance, supplement, or replace a traditional educational curriculum. 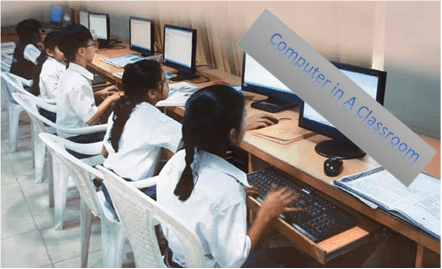 As computers have become more accessible, inexpensive, and powerful, the demand for this technology has increased, leading to more frequent use of computer resources within classes, and a decrease in the student-to-computer ratio within schools. Many schools, colleges and training centers used computer mainframes in education since the initial days of this technology and throughout the initial development of computers. The earliest known large-scale study of educational computer usage conducted for the National Science Foundation by The American Institute for Research concluded that 13% of the nation’s public high schools used computers for instruction, although non-users still outnumbered users at a ratio of 2 to 1. The study also concluded that computers proved to be very popular with students, and that applications run on early models included sports statistic managers, administration tools, and physics simulators. Computer aided instruction gained wide spread acceptance in schools by the early 1980s. It was during this period that drilling and practice programs were first developed for exclusive classroom use. Schools became divided over which computer manufacturers they were willing to support, with grade schools generally using Apple computers and high schools preferring DOS based machines. Hardware shortages in schools became a major issue, leaving many teachers unable to provide enough computers for students to use. Despite this, by 1989 computer usage shifted from being a relative rarity in American public schools, to being present in nearly every school district. The interactive whiteboard is an example of computers replacing traditional classroom technology. Correlating with the development of modern operating systems like Windows 98 and the continuing support of government funding, the prevalence of educational computer usage boomed during this era. Between 1997 and 1999, the ratio of students to multimedia computers decreased from 21 students per machine to less than 10 students per machine. Colleges began creating specialized classrooms designed to provide students with access to the utilization of the most modern technology available. Classrooms such as the “Classroom 2000” built at Georgia Tech in 1999 which featured computers with audio and video equipment designed to capture detailed recordings of lectures as a replacement for traditional note taking began to become more common. By 2000, the student to computer ratio at some schools in the US decreased to only five students per school computer.